Location: East side of Blackhouse Hill and south of present Cliff Road. Cliff Close runs across the station site. Notes: Hythe station was inconveniently sited high on the hillside overlooking the town. To reach the station involved a steep uphill walk that proved too much for one unfortunate passenger in June 1909. Having made the exhausting climb from the town, Mr Hill bought his ticket and was waiting on the up platform when he collapsed and died following a heart attack! In the early days there was a horse-drawn bus service to convey passengers between the town and the station. The poor siting and steep climb clearly contributed to the decline in the station’s use in later years. The station was built into the side of the hill with massive stone retaining walls on the south side as the land dropped sharply; these can still be seen. The station was sited between two bridges, Blackhouse Hill to the west and the station approach road (the southern section is now a continuation of Station Road) to the east. There were two facing platform with road access to both. The main station building was on the up side where there was a forecourt off the approach road with steps up to the station entrance. The platforms were faced with timber. The main station building of a standard SER design was single-storey and built of Kentish clapboard beneath a hipped slate roof. There was wide canopy, with a curved cross section and an attractive deep valance supported by four timber columns. A small canopy was provided above the entrance door from the forecourt to protect passengers arriving by carriage from the weather. The building comprised from west to east: gents' toilet, ticket office, combined booking hall and general waiting room, ladies’ waiting room and toilet and porters' room. A separate timber building at the east end was the stationmaster's office. At a later date a new gents' toilet block was built at the end of the stationmaster's office and the old toilet within the station building became a parcels office. On the down platform there was a timber shelter which possessed a similar, but wider, canopy with a curved roof stretching across the platform and projecting over the small down side forecourt which was on level ground. The canopy was supported by a Kentish clapboard wall and sides at the back of the platform with a centrally placed door onto the forecourt and four timber columns on the platform. There was a signal box between the east end of the up platform and the approach road bridge controlled access to the goods yard to the east of the station, with sidings on both sides of the line. There were two sidings on the down side serving the coal yard and two sidings on the up side, from where there was a rail connection to the Hythe & Sandgate tramway. Facilities at the station were gradually improved over the years. Initially there was no goods shed but in 1875 a lock-up roader shed was provided on the down platform. Roader Sheds were wooden structures erected by the South Eastern Railway at stations whose traffic did not warrant a proper goods shed. The company had originally received an estimate of £850 for a larger goods shed but considered this too expensive and opted for the smaller roader shed. A few months later £130 was spent on a carriage and horse dock which was built on the up side. In 1902 a 30cwt capacity crane was provided on the down side between the two sidings. The stationmaster's house was damaged during landslips in the 1870s. In 1904 a large new house was provided for stationmaster William Fright in a more convenient position on the north side of the station. The building is extant and now in private occupation. In 1907 William Fright became stationmaster at Westerham and William Harris transferred to Hythe from Horsmonden, arriving on 9 November that year. One of his first jobs as stationmaster was to deal with another death at the station when local coach builder William Worthington was hit by a train late one evening. In 1908 the company spent £450 on new stables for six horses, sited on the south side of the up yard. The company also purchased new vans in order to operate their own collection and delivery service which started on 12 October. 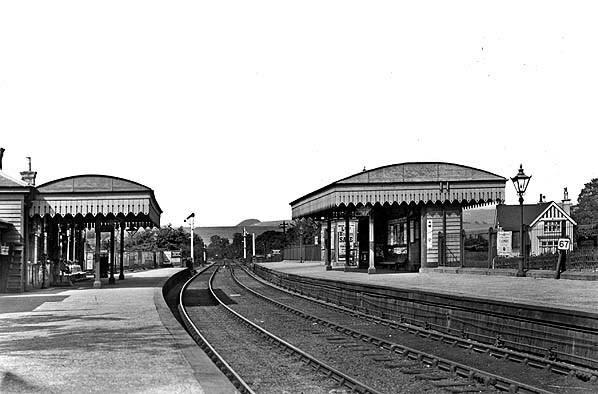 Further improvements were made to the station in 1910 when the original timber fencing at the rear of the down platform was replaced with iron railings. Gas lighting was installed with gas being supplied by the Folkestone Gas & Coke Company. On 21 September 1925 the station was renamed Hythe (Kent) to avoid confusion with other Hythes in Hampshire and Essex. In 1926 the Hythe Chamber of Commerce asked the Southern Railway to provide a covered goods shed as many parcels they had received were wet. The Southern Railway declined, stating that the station handled insufficient goods traffic to warrant a larger goods shed. Following the closure of Sandgate station the remaining line was singled and Hythe signal box was taken out of use over the weekend 4/5 July 1931. As watering facilities were no longer available at Sandgate, the Southern Railway provided a circular water tower incorporating a water crane, at the north end of the up platform. Following the retirement of stationmaster William Harris on 2 May 1931 Hythe came under the jurisdiction of the stationmaster at Sandling Junction. The reduced staffing level at Hythe now only comprised two grade 1 porters and two lengthmen. The station was renamed Hythe for Sandgate in November 1931 but reverted to Hythe on 5 July 1939. During WW2 the parcels office at the west end of the station building took a direct hit during an air raid, just missing one of the porters who was sheltering in the chimney breast of the adjacent booking office. The office was damaged beyond repair and was never replaced. After closure in 1951, the station site remained derelict for a number of years before being redeveloped c1960s with the houses along Cliff Road and Cliff Close which now occupy the site of the station and goods yard. The southern approach road (Station Road) is extant and looks much as it did when the station was open. Hythe is a small coastal market town on the edge of Romney Marsh. The name Hythe or Hithe is Saxon in origin meaning haven, harbour or landing place. As an important Cinque Port, Hythe once possessed a bustling harbour which, over the past three hundred years, has now disappeared owing to silting. Hythe’s status gradually dwindled with the receding sea, and by the middle of the nineteenth century it was described as 'the filthiest and most immoral town in Kent'. All that was to change with the coming of the railway. The South Eastern Railway reached Folkestone on 28 June 1843 when a temporary station was opened on the west side of the Foord valley. The SER promised an intermediate station between Folkestone and Ashford which would serve Hythe. Westenhanger & Hythe station opened on 7 February 1844 but at over 3½miles from the town, and most of that uphill, the people of Hythe were understandably not happy with their new station. Initially, complaints to the SER fell on deaf ears as the company was busy with drainage and construction work at Folkestone Harbour, which it had recently purchased. With the opening of the branch line to the harbour on 1 January 1849, the SER was prepared to listen to proposals to build a line to Hythe. On 25 November 1851 a local paper reported, ‘Great efforts are being made to procure a branch railway to the town. ... the South Eastern Company has offered to make the line, if the land be presented to them free of cost.' The SER was well aware of local feelings and, keen not to alienate the public, offered to consider any serious proposals. One proposed route was surveyed by the chief engineer but he came to the conclusion that a carriage road was the best option. Further proposals came and went including a new line between Folkestone and Shorncliffe military camp which could then be extended west to Hythe, but by this time the SER was involved with more profitable ventures elsewhere, and it was soon clear that they had no intention of building a branch line. There was however a glimmer of hope when a proposal was submitted to the SER board bringing to their attention ‘the advantages of constructing a branch from Westenhanger to Folkestone providing a new and more convenience route to the continent as an alternative to the present steeply-graded harbour branch which is inconvenient to passengers as it requires a change of engines and a reversal’. A number of different routes were proposed and, in 1861, the SER introduced a Bill into Parliament for a branch line from a junction at Cheriton running to the east of Sandgate and on to Folkestone Harbour. The Bill sailed through the Commons but, despite enthusiastic local support, it was stopped in its tracks in the Lords owing to opposition from influential landowners. 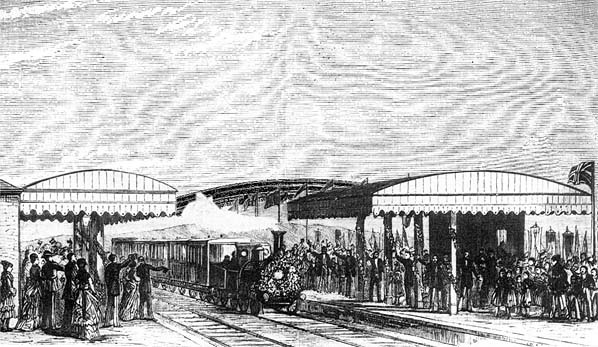 In an attempt to placate the people of Sandgate the SER opened a new station on the west side of Folkestone on 1 November 1863. The diminutive station with minimal facilities was called Shorncliffe & Sandgate although it was a mile from either place. At the same time Westenhanger station was rebuilt. The SER was still keen to pursue the construction of a branch to Sandgate and in February 1864, Francis Brady, their newly-appointed chief engineer, visited Sandgate where he outlined the latest scheme. It would make a junction with the main line at Sandling, running along the back of Hythe where there would be a station, then on to Shorncliffe Camp where a station would be provided to serve Sandgate. The board postponed a decision on the line until they had seen passenger figures for the stations at Westenhanger and Shorncliffe. With the Sandgate branch on hold, the Elham Valley Railway Company published a prospectus in 1865 with received wide support. The proposal was for a line running from Hythe to Canterbury where it would make a junction with the London, Chatham & Dover Railway, and junctions at both ends with the SER. This prompted the SER to revive its scheme, fearful that the Elham Valley might be bought out by its hated rival the LCDR. The SER galvanised itself into action by ordering its surveyors and engineers to prepare the Sandgate branch surveys and drawings ‘without delay’. It was stated that the proposed line would provide a new direct route into London, with heavy traffic expected between the capital and the south coast. The promoters also claimed that their line would be of strategic national importance during the expected French invasion, providing a direct link between Shorncliffe Camp, the military base at Hythe and the Woolwich Arsenal. A Bill was put before Parliament in the winter of 1866, but this was opposed by both the LCDR and the SER. Although it was sanctioned by Parliament, the company was unable to raise sufficient capital. On 25 January 1870 the Hythe & Sandgate Railway Company was registered. The line would run for almost a mile along the sea front which would be ideal for a new seaside development. The Seabrook Estate Company was formed to build the new resort, the directors of which were almost all involved with the railway. The SER was confident that once the railway reached Sandgate there would be little difficulty in securing authority to extend the line to Folkestone harbour, which was still their goal. Indeed, it appears that the very existence of the branch was pinned entirely on this one hope. There were still, however, many hurdles to cross, particularly from the War Office who owned much of the land and were demanding an exorbitant price. Although negotiations over the purchase of this and other land along the route were not completed at this time, it looked as if Sandgate and Hythe would get their long awaited railway. Powers to construct a 3-mile double-track railway from Sandling on the main line to Folkestone and Dover via Hythe to Sandgate were included in South Eastern Railway Act of 1872. The contract for the construction of the line was awarded to Philip Stiff, the cheapest of 11 tenders submitted. Prince Arthur of Connaught, a grandson of Queen Victoria, performed the ceremony of the cutting of the first sod on 11 April 1872 after which a local newspaper reported, ‘The work of the line will be pushed forward with all possible despatch. There will be no tunnelling but some rather deep cuttings. It is expected that the branch will be opened for traffic by May l873’. By 15 June 1872 work was underway at Saltwood while negotiations for the purchase of land elsewhere on the route were still taking place. The War Office was still holding out and eventually the SER had no option other than to agree to their inflated asking price. The line presented no major engineering difficulties and excavation of the 94yd tunnel under Hayne Wood and the deep approach cuttings were quickly underway. The onset of winter brought heavy rain which slowed progress, and it was soon clear that the expected completion date could not be met. With the earthworks nearing completion, the station layouts at Hythe and Seabrook were mapped out for approval by the Board. Neither station was particularly well sited; at Hythe there was a long walk uphill, and at Sandgate the station was a mile to the west of the town. It was built to serve Shorncliffe Camp to the north and the new holiday development at Seabrook to the south. A more convenient station for Sandgate would be provided on the Folkestone extension. Further delays in construction were encountered and the opening if the line was further pushed back, first to May Day 1874 then, following a landslip in the Hayne tunnel, to late June. It was soon clear that the SER made a bad decision to go with the cheapest contractor and eventually the SER was forced to take over construction of the line. Philip Stiff agreed to a pay-off of £6,500 which included the handing over of all tools, machinery, sheds, materials etc, to allow the SER to finish the job; these would be returned to him on completion. With SER labourers now at work, construction progressed rapidly and on 29 August the line was inspected for the Board of Trade by Lieut. Col. C. S. Hutchinson R.E. The colonel refused to sanction the opening until a number of changes, mainly relating to signalling, had been made. Once these had been completed and approved, the official opening was announced for 9 October 1874. Before this, the SER approached Folkestone Corporation asking them to contribute towards the cost of the harbour extension; this was turned down. They also approached Lord Radnor, a major landowner along the route, suggesting that the required land might be donated to the company. Not surprisingly he declined, implying that while he was not opposed to the railway in principle he did expect to receive the full value of the land. SER chairman Sir Edward Watkin was not prepared to commit the financial outlay at that time; perhaps that was the ultimate error of judgement as Lord Radnor's views were to change and the extension would never be built! On the opening day, the departure of the first public train at 10am from Sandgate was somewhat muted with few local residents boarding the train; not even the chairman or members of the local board had bothered to put in an appearance. It was a different story at Hythe where the train was met by an enthusiastic crowd at the lavishly decorated station. Having travelled on to Ashford the train, by now packed, made the return journey to Hythe in time to see the arrival of the Royal Train which brought members of the SER board, SER chairman Sir Edward Watkin (who was elected MP for Hythe on 4 February that year) and the Duke of Teck who had agreed to perform the opening ceremony. The initial service comprised eleven up and nine down trains on weekdays with just two trains in each direction on Sundays. As there was no junction station branch trains ran along the main line to terminate at Westenhanger. There was no goods service until 1 January 1875. The line quickly proved popular with local people and the company was satisfied with passenger receipts. An engine shed was provided at Sandgate (a sub-shed of Ashford). This was used to stable one engine to work the first and last train of the day. 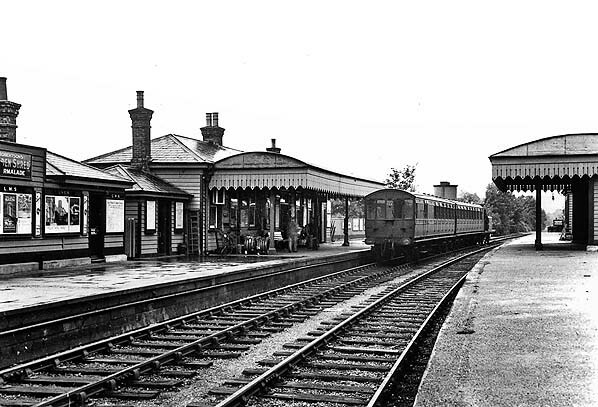 Hythe was the busier of the two stations but passenger numbers at Sandgate were boosted as more and more troops were conveyed over the branch as the station was nearer to Shorncliffe camp than Shorncliffe Camp station on the main line. After ten years, the train service remained much the same with ten weekday trains in both directions, although Sundays saw an improvement with four trains. As each year passed so the feasibility of the Folkestone Harbour extension receded as property prices increased and land was used up for new buildings. In 1886 the SER proposed building a station at the junction between the Sandgate branch and the main line. At this time there was little habitation around the junction, only scattered farmsteads, and even today the area is sparsely populated. The new station would have interchange facilities although it was planned that the boat trains (which never came) would run directly through Sandgate to the harbour. Sandling Junction opened 1 January 1888. From that date branch services that had started from Westenhanger now ran from Sandling Junction. By the last decade of the nineteenth century, passenger excursions were becoming very popular despite the need to change trains at Sandling Junction and Shorncliffe. Monday-only excursions proved to be particularly in demand, especially during the Christmas and New Year holidays when the London pantomimes enchanted young and old alike. As the stations at both Sandgate and Hythe were poorly sited for the towns they served the SER opened a horse-drawn tramway in 1891 to link the stations with the two towns. It ran along the streets in the towns but had its own dedicated track along the seashore between Sandgate station and the Imperial Hotel at Hythe which was built by the SER in 1880. Old rivalries finally came to an end on 1 January 1899, when the SER and LC&DR formed a 'management committee' comprising the directors of both companies. This merged the two companies' operations as the South Eastern & Chatham Railway. Numerous improvements to the Sandgate branch would soon be introduced, many of which had already been planned and approved by the SER. There were only marginal changes to the timetable with a couple of extra daily trains in the summer. The Sunday service was improved with a dozen trains in each direction confirming the popularity of the locality with holidaymakers and day-trippers. As well as the increase in tourist traffic the line earned a regular income with ordinary local passenger and goods traffic. There was extra revenue too from military traffic with supplies, horses and soldiers frequently passing over the branch. As the line reached its 30th anniversary it became clear that the railway would never be extended beyond Sandgate. Unrelenting opposition from powerful quarters, rising land values and ever-increasing costs of construction all played their part in ensuring that Sir Edward Watkins’ dream would never be fulfilled. Through the first decade of the new century, excursions continued to add to the revenue-earning ability of the branch; some were laid on by the SE&CR while others were organised by private entrepreneurs. In 1902 the SE&CR laid on special trains from all over its network for the coronation of King Edward VII; two of these ran from Sandgate at 4am and 5am. Efforts to stimulate more passenger business for the branch came in 1905 when, for the first time, Hythe enjoyed the prestige of having through trains to the north of England. Co-operation between the SE&CR and the Midland Railway meant they were able to organise a weekdays-only service departing from Hythe at 11.09 to reach Manchester at 6.10pm and Bradford at 7.28pm. hopefully, encourage development around Hythe station but, alas, it was too little and too late. In July 1907 steam rail-motors were tried on the branch. These ran from Dover, eliminating the need to change trains at Sandling Junction. The frequent service proved popular with the public but their standard of comfort did not as the units vibrated badly, especially when the engine was at the rear. Also, the speed of the small locomotive and its combined carriage was limited when heavily loaded or on the steep gradients of the Sandgate branch. In 1908 Improvements to the rail-motors followed, and they continued to augment the summer services which were sometimes so well patronised that a second trailer car was added - which hindered their speed even more! There were six railcar journeys on weekdays, except Thursday, and five on Sunday. The rail-motors were short lived on the branch and they were withdrawn at the end of the 1910 summer season. With the outbreak of WW1 in 1914 everything on the railway was to change as the Sandgate branch had a vital role in the war effort. Nationally, all railways came under the control of the government; on a local level this meant that the horses stabled at Hythe by the SE&CR were soon requisitioned for the war effort, as were the horses on the Hythe & Sandgate Tramway which was suspended on 7 August 1914. By October the scene at Sandling junction was one of furious activity as a military camp was built, with special trains laid on for workmen employed on the construction. Troop trains to Sandgate arrived in quick succession as thousands of young men de-trained to form columns of four for the march to Folkestone harbour. The amount of rail traffic increased further, forcing the SE&CR to withdraw all discounted excursions and other cheap tickets. In December 1915 there was a major landslide at Folkestone Warren which effectively severed all rail traffic between the two channel ports for the duration of the war. This meant that Sandgate and Folkestone were put under greater pressure to handle the large numbers of troops, horses, supplies, ammunition and stores which arrived from all parts of the country. With the railway now handling so much military traffic local people deserted the trains for the buses. When the British Automobile Traction Co Ltd began a service between Hythe and Ashford in early 1916, it proved popular, with four journeys each way, even though their ‘bone-shakers’ took an uncomfortable hour to complete the 11-mile journey. The Sunday service was withdrawn from 1 January 1917 and at the same time there was a 50% fare increase and a reduction of the weekday service to ten trains in each direction to lessen the burden on the railways, as well as ensuring that the important military traffic was not hindered. In an attempt to cope with the severe staff shortages owing to military call up, a number of young lads were recruited to man the stations at Hythe and Sandgate as porters, goods handlers and clerks. Peace came on 11 November 1918, but services did not return to normal until 1921 when the new summer timetable had 17 up trains and 16 down replacing the previous emergency schedule. A Sunday service of two trains each way was reinstated, but this was later increased to eight trains each way in 1923 although still only during the summer season. The Hythe & Sandgate Tramway resumed operations after the war during the summer season, but it was to be short lived with the tramway closing at the end of the summer in 1921. The timetable may have returned to normal, but in changing economic conditions the railway was now in decline as it was unable to compete with the convenience of the motor bus. On 1 January 1923 the line came under the control of the Southern Railway under the 1923 Grouping, and change was already on the horizon. In an attempt to attract more holiday traffic to Hythe, posters were prominently displayed at London termini and other important stations in the south-east. 1923 was a good year with hot weather bringing an influx of holidaymakers and day-trippers. At the start of 1924, Hythe Chamber of Commerce organised a competition to write a memorable slogan to promote the town. The winning catchphrase was 'The Pride of Kent' and this appeared on Southern Railway posters during the inter-war years. On 16 July 1927 the 13½-mile 15in gauge Romney, Hythe & Dymchurch Railway opened, running from Hythe via Dymchurch, St. Mary's Bay, New Romney and Romney Sands to Dungeness. As well as being a tourist attraction, the railway also provided a public service between the small towns and villages along the route. In 1928 there was a proposal to extend the line to the Southern Railway station at Hythe, but this was never built. Through the 1920s, the Southern Railway actively encouraged passengers to switch from rail to road transport, which is perhaps not surprising as the Southern Railway owned 49% of the shares in the East Kent Road Car Co. It was clear that the SR intended to run down the rail service. By the end of the decade, most excursions had stopped running apart from those serving special events; the line had become little more than a rural branch. Easter 1929 brought an upsurge in passenger numbers with extra trains laid on for people who wanted a break by the seaside. In 1930 the Southern Railway announced plans to electrify the Folkestone line. The people of Hythe and Sandgate were optimistic that electrification would also eventually come to their neck of the woods. Little did they realise that the Southern Railway had already planned a completely different scenario for the branch! In October 1930 the SR announced that they intended to close Sandgate station, with no period of public consultation being offered. Fearful that Hythe might also be closed at a later date Sandgate and Hythe Council decided on a joint campaign to prevent the closure. A deputation put their case to the SR board in mid January 1931 but were told that a final decision had already been made, accelerated by the East Kent Road Car Co offer to buy the station site to build a new bus garage. With this offer on the table, the SR quickly prepared figures to justify the closure. As well as closing Sandgate the SR also intended to downgrade the remaining line from Hythe to Sandgate to single track. Closure followed quickly on Tuesday 31 March 1931 after nearly 57 years of use. A half-hearted attempt was made to ease the inconvenience caused to Seabrook residents by the introduction of a bus service between Hythe station and the former Sandgate station, but this was not well used and was withdrawn in 1933. Following the retirement of Hythe stationmaster WE Harris on 2 May 1931 Hythe came under the jurisdiction of Sandling Junction fuelling rumours the closure of Hythe would follow shortly. This was quickly denied by the General Manager of the Southern Railway who stated ‘the SR has no present intention of closing Hythe Station’. Single-line operation between Sandling and Hythe came into force from 6 July 1931 following the closure of No.2 box at Sandling Junction, with the branch now operating under 'one engine in steam'. Demolition of Sandgate station was underway towards the end of 1931 with only the gents' toilet on the former up platform being retained for use by bus crews. The track was initially retained as a siding from Hythe but by early 1932 it had been lifted. In 1933 rumours of closure were once again heard following the announcement that Sandling Junction was to be renamed 'Sandling for Hythe'; this prompted the Town Clerk to write to the Southern Railway stating that ‘a seaside town without a railway service was a very serious matter. Hythe is an important town and deserves an important train service!’. The SR once again denied that there were any plans to close the station and the summer timetable for 1934 had an enhanced service with nine additional trains (four up and five down) although the Sunday service remained as before with four in each direction. 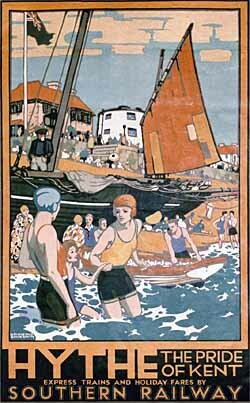 This level of service was maintained through the latter half of the 1930s with a renewed poster campaign promoting Hythe as the 'Pride of Kent'. By the end of the decade there were 12 trains to Hythe with 11 in the opposite direction. On Saturday this increased to 15 down and 14 up, whilst on Sunday 12 trains ran in each direction. All this was to change with the declaration of war in 1939. 'Operation Pied Piper', the evacuation of major cities, began on 1 September 1939. At this time many London children were sent to the comparative safety of Kent. Hythe was expected to take its quota of children who would be set down at Sandling Junction, as heavy main line engines were unable to reach Hythe due to restrictions on axle weight. Their stay on the south coast was, however, short-lived with evacuees being moved in June 1940, when a seaborne invasion was expected. To counter this invasion, new defences were established along the south coast and, with the need to use the branch for the movement and storage of rail-mounted guns, the passenger service was suspended. In September 1940, a detachment of the Royal Engineers attached to the 4th Super Heavy Battery R.A. established a base at Hythe. This unit comprised two 9.2in rail-mounted guns, two War Department locomotives, some French ferry vans for sleeping purposes and all the necessary ammunition, stores and supplies. One gun was soon stabled on the down line at the far eastern end of Hythe station, whilst the other went to sidings at Folkestone Junction. The war department did not take complete control of this line, as with the Elham Valley route. The Southern Railway continued to operate its daily goods service, although this was re-timed an hour later in the evening to leave the line clear for military movements during the day. 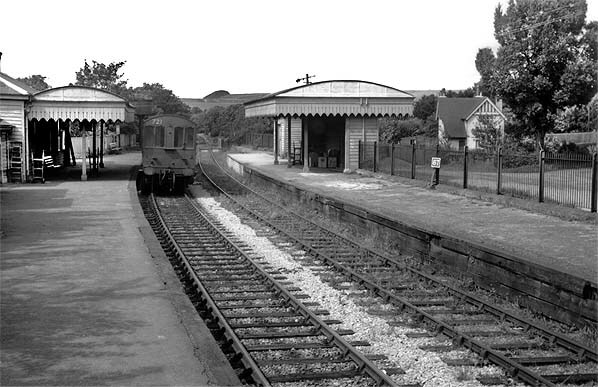 The battery was relocated to the Kent & East Sussex Railway on 10 February 1941, and in 1942 a passenger service was reinstated with nine trains in each direction on Monday-to-Friday and ten on Saturday. This service was, however, short-lived and was withdrawn from 3 May 1943 for the duration of the war when the branch was once again required for military use. The WD was anxious to stable a 13.5in gun at Hythe and possibly an 18in howitzer in the 94yd Hayne tunnel. The guns never came and, as the threat of invasion receded, the military relinquished all further use of the Hythe branch as part of their operations. The Southern Railway reinstated the passenger service on 1 October 1945 in response to public pressure but it comprised only two up trains, one at 7.50am and the other at 6.12pm. There was only one down train arriving at Hythe at 5.10pm. The Saturday service was slightly better with three trains in each direction but there was no Sunday service. A post-war report on the resumption of the electrification programme included a proposal to use diesel traction on the Hythe branch. The bus companies were quick to take advantage of such a poor service and soon relieved the railway of many of its few remaining passengers. East Kent buses continued to provide a regular service between Hythe and Folkestone and local operator Newmans' introduced a service between Hythe and Sandling in direct competition, with buses timed to meet the London arrivals. Following Nationalisation in 1948, a deputation from Hythe met representatives of the newly-formed Southern Region of British Railways in an attempt to secure a better service for their town. In response, BR assured the group of their ‘intention to restore the railway service to Hythe up to its pre-war standard at the earliest possible moment, but that coal and carriages were the limiting factor’. They could not, however, give any guarantees that Hythe would remain open for goods traffic as it was now policy to concentrate merchandise from small stations at larger railheads. 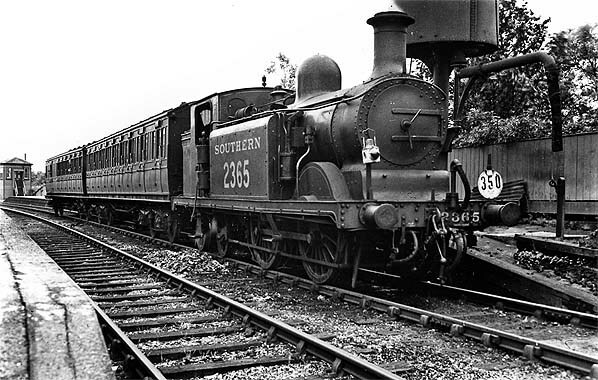 A request for more trains to stop at Sandling Junction was rejected, but BR did promise to consider the re-introduction of Sunday trains before the start of the 1949 summer season. Despite a hot summer, Sunday trains were never reinstated, and it was soon clear that the branch was on borrowed time. In December 1949 the East Kent Road Car Co launched a new service between Hythe, Sandgate and Folkestone. In 1949 there were 33 railway season ticket holders; two years later there were only six! In July 1950 a traffic census was carried out, and a report of goods receipts was prepared which led to a proposal to withdraw the passenger service with the goods yard remaining open; but in 1951 the Civil Engineering Department stated that repairs to the line costing around £8,000 would soon be due. This expense could not be justified as most merchandise to and from Hythe now went by road. The only substantial inbound traffic was household coal and stores for Mackeson’s Brewery. Outbound freight comprised mainly returned empties from the brewery as well as some small parcels traffic. It was felt that there would be little hardship caused to the few passengers carried by the line as extra buses would be provided to take them to Sandling Junction or Folkestone Central. British Railways decided they could no longer justify keeping the line open for either goods or passenger traffic and closure was announced for 3 December 1951 with the last train running on Saturday 1 December. On the last day a large number of railway enthusiasts descended on the branch to ensure that it went out in style. The track was probably lifted back to Sandling Junction goods yard in the summer of 1954. Photographs from October 1954 show disturbed ballast indicating recent track lifting. The goods yard closed 4 February 1973 but two refuge sidings were retained with a short length of the branch line acting as a head shunt for these sidings. The last vestige of branch track was removed c1990. Today the route from Sandling to Hayne Tunnel is a public footpath (Elham Valley Way). Hayne Tunnel is still in good order but is flooded up to several feet deep because part of the cutting to the south of the tunnel has been partially infilled with refuse. At the site of Hythe station and around Seabrook there are many houses built on the old railway embankment. Between Hythe and Sandgate short sections of infrastructure are still visible including some bridges in situ; but at Sandgate the bus garage came and went and the station site has now been redeveloped for housing. Route map drawn by Alan Young, Timetables from Brian Hart. Tickets from Michael Stewart, Proof reading Alan Young. Special thanks to Brian Hart for photographs and information and for answering my numerous questions about the Sandgate branch. Crowds gather at Hythe station for the opening ceremony on 9 October 1874. The passenger service started the following day. 1898 1:2,500 OS Map. The station is sited on a flat areas excavated in the side of the hill. The retaining wall is seen to the west of the station. The station approach road passes under the line to the east of the station with direct access to both platforms. Sidings are seen on both sides of the line. The coal yard is on the down side with the livestock dock at the end of the long siding on the up side. The signal box is seen on the up side north of the approach road bridge. The small yard crane is seen between the two sidings on the down side. The roader shed is seen on the up platform just north of the shelter. The Hythe & Sandgate tramway is seen running south from the station forecourt with a direct connection to the Sandgate branch in the up side yard, Click here to see a larger version. 1933 1:2,500 OS Map. The line has now been singled with only one track shown north of Black Horse Hill bridge. The signal box is still shown but not named, as it had been. The Hythe & Sandgate Tramway has closed and the track has been removed. 1958 1:2,500 OS Map. The station has been closed for seven years. The track was lifted in 1954 and the up side platform buildings are shown as 'ruins'. The down side canopy appears to have gone but the roader shed on the platform is still there. 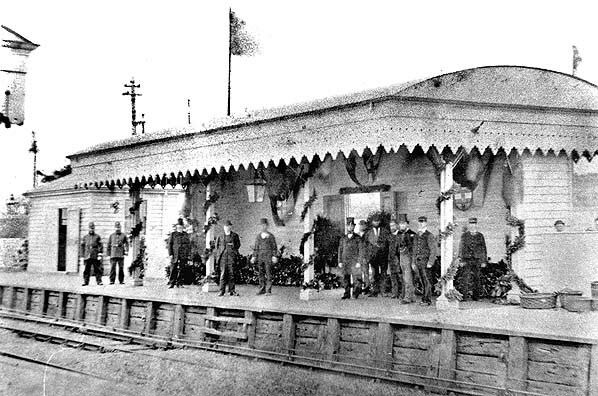 The down side waiting shelter has been decorated and dignitaries and staff are waiting on the platform, probably for the arrival of the Prince of Wales on 15 October 1881. His visit was to officially open the sea wall and the Princes Parade, a sea defence running between the RoyalMilitary Canal and the sea. A Cudworth 118 class No.246 is seen at Hythe station blowing off excess steam, having arrived from Sandgate in the 1890s. The signal box is seen at the end of the platform. 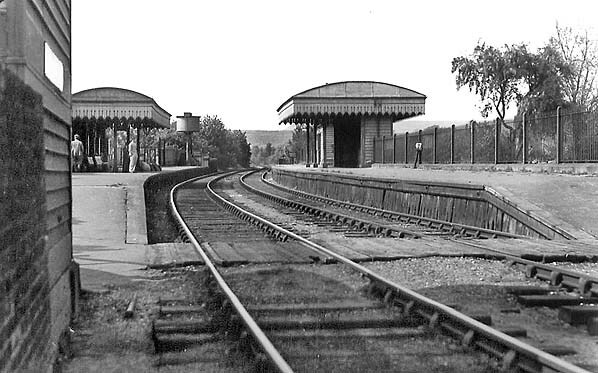 Hythe station looking north-west towards Sandling Junction c1904. The station staff are seen on the up platform; stationmaster William Fright is third from left. Note the sign for the gents' toilet on the far left. The gents' was originally located in the station building but a new toilet block was later provided next to the stationmaster's office (door on left). The position of the up starting signal indicates that a train from Sandgate is due. A Sunday school outing waits for the arrival of its train from Sandgate in 1910. 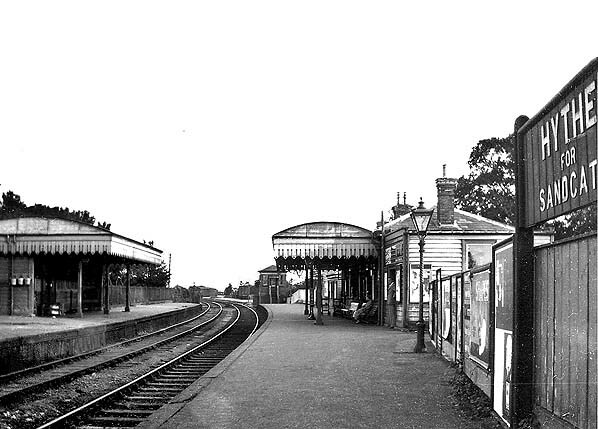 Hythe station looking north-west from the up platform in 1921. The two signals are set to 'all clear' indicating that the Hythe box (behind the photographer) is switched out. 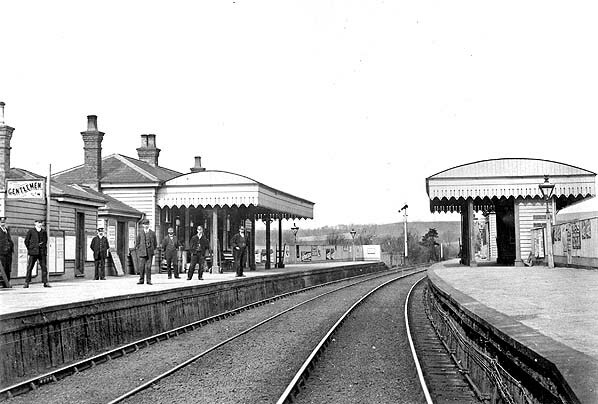 Note the metal railings at the rear of the down platform on the right; these replaced the original wooden fencing in 1910. A gas mantle is also seen in the lamp housing; gas was supplied by the Folkestone Gas & Coke Company. The stationmaster's house is seen in the background; this replaced an earlier house in 1904.
to the south of the station. Kent & East Sussex Railway. 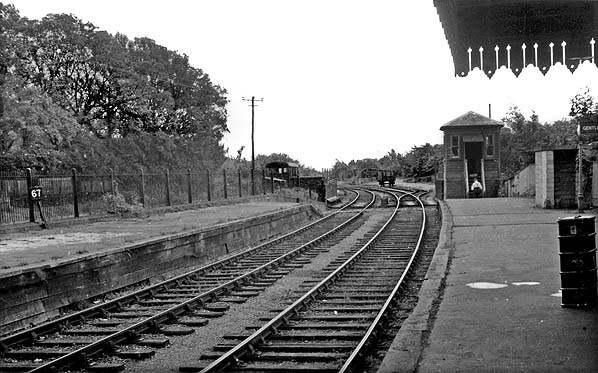 Hythe station looking south-east from the up platform in the mid 1930s. The station was renamed Hythe for Sandgate on 21 September 1925. 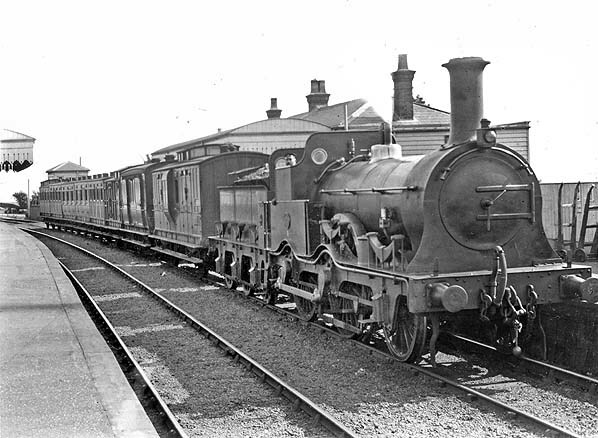 'Push-and-pull' unit No.721 is seen with a Sandling Junction service at Hythe station c1930s. The down track is rusty and covered with weeds indicating that it has been disused for some time. 'Push-and-pull unit No.722 waits for passengers for Sandling Junction on a wet day in July 1938. Note the poster boards on the left advertising, from left to right, destinations on the LMS, LNER and GWR. to work on the Hythe branch.